Back in our Productive Hobbies Series, we said learning a new language is among the recommended productive hobbies. We discussed how learning a new language could be an effective way of connecting with people from different backgrounds and cultures. However, like many things in life, learning a new language has its challenges. In this article, we will highlight some of the challenges of learning a new language and discover how to overcome some of these challenges with the app Memrise. Being exposed to a large amount of information is one of the biggest challenges when it comes to language learning. Learning a new language involves being introduced to thousands of words. Not only that, each language has its own set of grammatical rules that in many cases are different to the rules one is used to. Because of the vast amount of information involved in the process, picking up a new language takes time. This information needs to be taken little by little, so it can sink in our minds. The process demands time and patience. Pronunciation rules differ from one language to the other. For example, in English the word ‘phone’ is pronounced as ‘fone’ not ‘pone’, and this can be tricky especially if you are not a native speaker. Motivation, motivation…What can we do about motivation? One minute we are so enthusiastic to learn a new language, but find ourselves struggling the next minute. One thing to consider here is the reward of those who embark upon a journey of knowledge for a good cause or with good niyya [intention], and making it somehow for the sake of Allah . The Prophet said: “Whoever takes a path upon which to obtain knowledge, Allah makes the path to Paradise easy for him” [Jami’ at-Tirmidhi]. Different software packages and apps address different challenges and vary in their levels of success. In this article, I’m going to discuss the app ‘Memrise’. 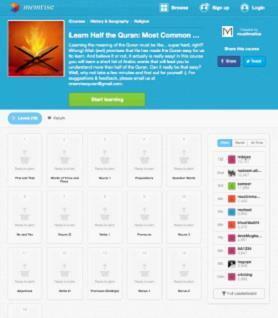 Memrise is a free, interactive flashcard program that serves as an effective tool for language learning. 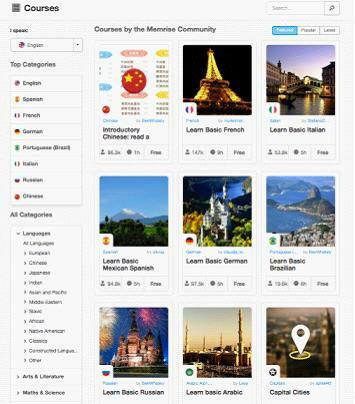 It is a crowd-sourced language learning tool that can be accessed online or via Android and iOS. 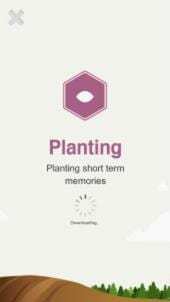 It is predominantly a tool aimed at helping users build vocabulary and grammatical knowledge through memorising words and phrases. It also aims to help get a linguistic grip on subjects like history and science. Because of the crowd-sourced nature of the app, there are many courses being offered, and some of them are in fact quite good, like Middle Eastern Languages and European Languages. The app does a good job at tackling three of the above-mentioned challenges. For example, the difficulty of learning a large amount of information is tackled very well. The app does so by breaking the information into manageable lessons and it tells you when you should repeat those lessons to strengthen your retention prowess. 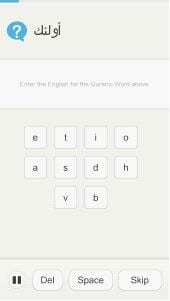 The app also tests you on vocabulary through a variety of approaches, including picking words from a multiple choice list, unscrambling letters and also typing words from memory. Although these approaches may be simple, they have been well organised to build your knowledge from a few basics words up to a larger pool of vocabulary. The challenge of time constraints is also addressed through the app. Each lesson is presented in a quick style. In only a few minutes, you can get some effective practice. Finally, Memrise addresses the motivation issue by adding an element of gaming to its learning. Every new word is a ‘seed’ that needs to be planted, and once you have planted it, you must water it consistently to keep it alive and healthy. To make learning a language more interesting, you earn points as you learn. So, the more you practise, the more points you collect. To make things even more interesting, you can see your ranking against other users from all over the world. If you want your friends to join you, then there is an option of connecting Memrise with your social media account. Being crowd-sourced means the app offers many courses. However, it also means the quality of the courses is inconsistent. As such, you have to be careful when choosing a good course. One way of ascertaining if a course is good is by checking how popular it is among other users. You can do that by checking the user icon below each course. Finally, while the flashcard approach is good for learning vocabulary, when it comes to picking up grammar, it falls short a little as there is no detailed explanation of each rule. 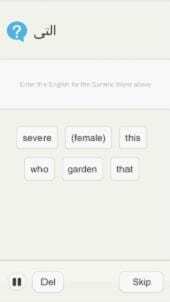 Memrise alone may not teach you how to speak a language fluently, but it does serve as an excellent supplementary resource. It could even serve as a quick way to pick up essential vocabulary before travelling to a foreign country. You can use the app directly through its website or through the free mobile apps (iPhone & iPad App / Android App). Now tell us, what other tools do you use or what other productive ways do you follow to learn a new language?